Stabber who wounded Jewish shopper identified as Arab minor from Judea who entered illegally with help of Arab citizens. 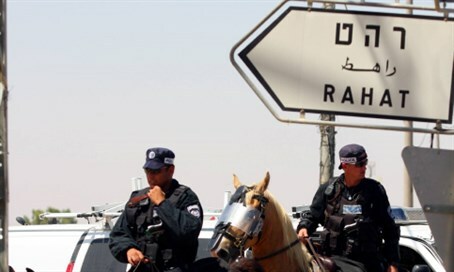 It was released for publication on Wednesday that the Arab terrorist who earlier this month stabbed a 65-year-old Jewish woman as she was shopping in the Bedouin city of Rahat in the Negev has been caught. The terrorist stabbed and moderately wounded 65-year-old Shlomit Gonen in the neck as she shopped in the southern city's market on February 6. He was caught on security cameras as he fled the scene. The Israeli Security Agency (ISA) revealed on Wednesday that the terrorist is a minor aged 17 years old, and hails from Yatta in the Hevron region of Judea. An ISA investigation found the terrorist conducted the attack after having illegally entered the Bedouin town of Rahat. The terrorist first studied the landscape and planned his getaway route, gathering information ahead of his attack. The investigation also found that the terrorist was influenced by videos of recent terror attacks and incitement propaganda spread on Palestinian TV channels, including the Al-Aqsa Channel. The terrorist also took part in violent riots against IDF forces in Judea and Samaria in recent months, as he did during Operation Protective Edge in the summer of 2014. The terrorist and his family members breached the security barrier from Judea, and with the aid of Arab citizens of Israel living in the Negev entered sovereign Israeli territory illegally.